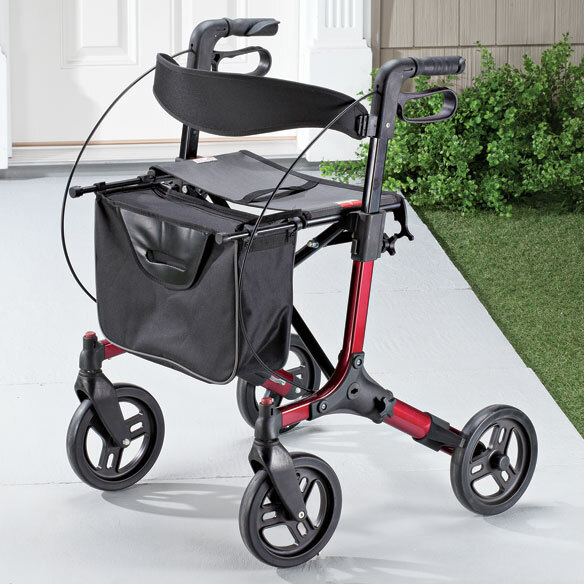 Stay on the move with a premium-quality Euro-style rollator. Quality details include large wheels that smoothly handle any surface, quick-stopping ergonomic hand brakes, comfy seat and backrest, and a convenient storage compartment for essentials. 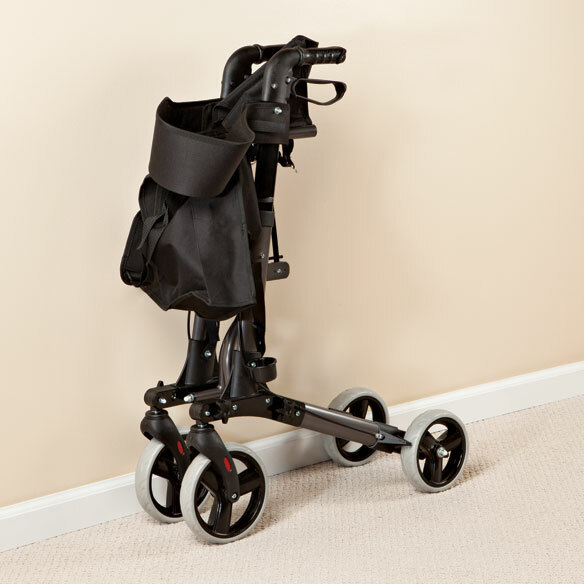 Compact, lightweight rolling walker weighs just 16 1/2 lbs. Folds for easy portability and storage. Metal walker supports up to 300 lbs. Overall 27”L x 24 1/2”W, handles adjust 31” – 36”H. Seat measures 8”L x 18”W. 8” front wheels, 7” rear wheels. Please add $10 additional shipping cost. WIDE SEAT AND GOOD WITH 300LBS CAP. Due to the big wheels, I wanted to make sure I can use this on different types floors. 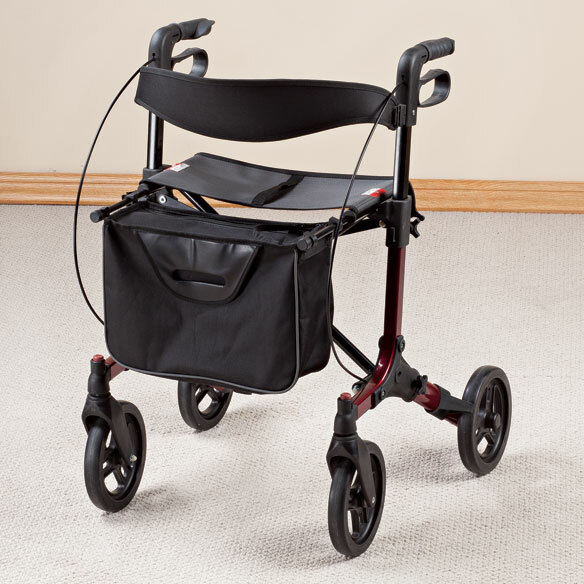 Need a walker that’s lite weight so my family can help me get around on my own. I have purchased this walker before. It is stylish, light weight and I get a lot of comment on it. 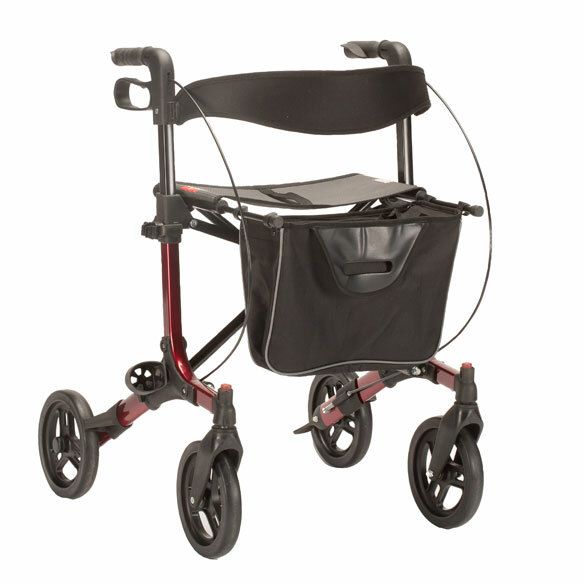 It gets around much better than the standard walker and this is a great price for it. This was ordered for a family member. I already have 2 rollators but only one with 8" wheels. They are so much easier to move about over different terrains. I bought this one because it's light-weight and has the larger wheels. I will put this one in my Denali and use my larger one in the house and retire the small one with the smaller wheels. I need something that is more compact than what I have, now. Is seat adjustable ? What is the seat height? How far does Back wheels extend from seat, for posture when walking? BEST ANSWER: Thank you for your question. The seat height is 21" high, from back wheel to front it is 27" long and is 24.5" wide. We hope this information will be of help to you. Can this be used as a wheel chair? BEST ANSWER: Thank you for your question. Unfortunately not his cannot be used as a wheelchair. We hope this information will be of help to you. Does it have a place to hold a cane? BEST ANSWER: Yes, there is a place to hold a cane: on the left side with a cup to set in and Velcro to strap it near the seat. What is the weight capacity of the seat? BEST ANSWER: Thank you for your question. The weight capacity is 300 lbs. We hope this information will be of help to you. BEST ANSWER: Thank you for your question. The folded dimensions are 14" H, 26" D, 13.5" W. We hope this information will be of help to you.